Interns Wanted | CCOF - Organic certification, education and outreach, advocacy and leadership since 1973. Peace and Plenty farm is located in Lake County, 2 hours north of San Francisco in Northern California. Lake County is primarily an agricultural area, with its main crops being walnuts, pears, and vineyards. With the largest natural lake in the state and a dormant volcano, the county has many lovely natural features and areas to explore and hike. Hot springs are to the east, the famous Napa and Sonoma wine regions are to the south, the Mendocino coast and the Pacific Ocean are to the west, and San Francisco is close enough for day trips (though the road is over a very twisty mountain road). The weather in Lake County ranges in extremes, from the very warm months of July and August, when it can reach up to 40 degrees Celsius, to hard frosts that begin in November with night-time temperatures reaching down to negative 5 Celsius. Thankfully, even in the hottest months of the summer, we are blessed with cool nights and breezes off the lake, that allow for comfortable rests. Lake County, much like the rest of California, has been plagued by wildfires for the last several years. Thankfully, the farm is somewhat protected from this threat by the “green buffer” of pear orchards and vineyards that surround us. The farm is a little over 7 acres and is bordered by vineyards and a seasonal creek, which makes a fine swimming hole in the late spring and early summer. The soil is sandy loam, and the farm has an excellent water source. We were certified organic in 2018 and continue to use organic methods and work towards creating a nectar and pollen-rich environment for beneficial insects and maintaining wild space for wildlife. Simon works full-time on the farm, and Melinda has a “day-job” so she splits her time between that and farm work. We have a dog, a cat, and chickens (for eggs) as well on the farm. 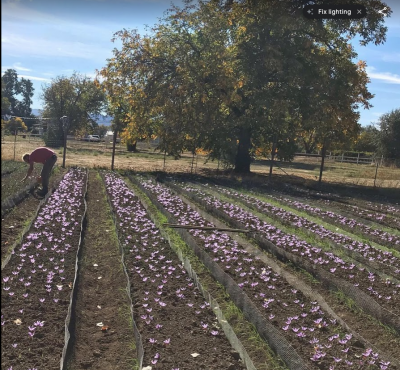 Peace and Plenty Farm was founded in the summer of 2017 with the intention of growing saffron on a commercial scale. We have had two saffron harvests so far (harvest October-November), with very good results and will be expanding our planting of saffron again this summer. The saffron harvest is extremely time-consuming as everything is done by hand. The flowers must be picked starting early in the morning, and the stigmas separated from the flowers and then dried all on the same day. Last year, we picked over 8,400 flowers in one day, and our 2019 is predicted to be three times what we had in 2018. Besides saffron, we have a small orchard of very old walnut trees that are dry-farmed and that produce a good amount of walnuts (harvested in September-November). In addition, we will be planting over 800 lavender plants in the spring of this year and adding a hoop-house and extending our raised beds for vegetable production. There is a good location and out-building for a farm stand, so we hope to work on that this year as well. Additional goals include: planting 100 olive trees and building a commercial kitchen on the farm. In addition to the crops, we operate a very successful farm-stay cottage, “glamping” tent cabin along the creek, and vintage Airstream for vacationers. Our proximity to the bay area allows for many visitors to these overnight accommodations. Weeding, planting, compost maintenance, harvesting of vegetables, fruit, nuts, and saffron, tending the farm stand, watering, pruning, lending a hand in the kitchen during pickling and jam-making season, leading tours of the farm, tending chickens, saffron processing, and trail maintenance along the creek. We are looking for folks who would either come to stay with us starting in the summer and stay through the saffron harvest in November, or two separate stays, one for the summer and one for the fall. We are very focused on finding folks who could be here for the saffron harvest (October-November). Interns on Peace and Plenty Farm must be able to deal with extreme heat (although work can be of course scheduled for early mornings before it gets too hot) and have a level of self-driven motivation that does not require us to over-supervise. We would prefer folks with some experience in farming. We will share some meals together, but we will ask that you prepare most of their own meals as our schedules will not always coincide to eat together (we work late in the summer). As we often have visitors on the farm staying overnight in our farm-stay accommodations, we ask that you are quiet in the evenings and do not play loud music if we have guests. Although only six hours a day are required, we ask that during saffron harvest, we would appreciate additional hours be given to help with this very busy time. Please keep in mind that during saffron harvest, you will be surrounded by bees. If you have a fear of them or a life-threatening allergy, please keep in mind that you will be in close proximity to many bees! Accommodation is a mobile home/trailer that will comfortably sleep two (two single beds). Due to the lack of privacy in the trailer, it is recommended that either a couple or two good friends take the two positions. The trailer is parked in a shady part of the farm, under a large oak tree, and is heated/air conditioned, and hooked up to water and electricity and equipped with a simple kitchen. A newly-constructed outdoor shower and composting toilet are provided a short step from the trailer. The farm is over 5 miles from the nearest small town and unfortunately, public transport is not available, so a car is pretty essential to get off the farm. We are not able to provide accommodations for pets or children. Simon and Melinda are omnivores though we tend towards vegetarian. We will provide food for you to prepare yourselves, including eggs from our chickens and fresh fruit and vegetables from the farm. The RV is equipped with a small but adequate kitchen for meal prep. We will work together with you on a meal-planning schedule once you are here so that we have time together to socialize and share. We tend to work late in the summer and sometimes eat the very simplest of quick lunches, so we feel it is fairer to allow you to prepare your own food on your own schedule. There are swimming holes and lakes nearby and hiking on Mt Konocti. Biking is also possible. The area is pretty sleepy, and there are not a lot of bars or cafes around, so someone who is after a quiet experience would enjoy this the most. A car is definitely recommended for those who want to get off the farm and explore as there is no dependable public transportation that is easy to access.